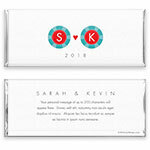 This simple and modern poker-chip monogram wrapper will make a statement at your celebration. Design: Monogrammed poker chips with heart detail. Personalization: Front initials, name and date as well as back title and message.